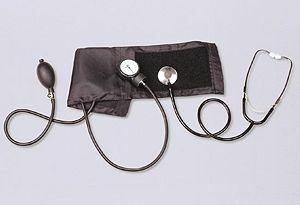 Low blood pressure can be ascertained using a conventional (mechanical) sphygmomanometer with aneroid manometer and stethoscope. In physiology and medicine, hypotension refers to a condition of abnormally low blood pressure, in contrast to hypertension, which is high blood pressure. Hypotension is best understood as a physiologic state, rather than a disease. Since blood pressure varies according to factors such as exercise and stress, and people can be healthy and yet have blood pressure well below the average, the term hypotension generally is reserved for a minimal condition where blood pressure is so low that insufficient blood reaches the brain, causing dizziness, lightheadedness, or fainting (Turkington 2004). There are many mechanisms and causes of hypotension, such as excessive bleeding resulting in loss of blood volume, congestive heart failure resulting in decreased cardiac output, or injury to the brain or spinal cord resulting in excessive vasodilation (dilation of arterial blood vessels). Diabetes can result in nerve damage that disrupts the reflexes that control blood pressure (Turkington 2004). Hypotension often is associated with shock, though not necessarily indicative of it. Hypotension can be a life-threatening condition, such as resulting in insufficient blood being received by an organ. However, many people also have a chronic problem of low blood pressure that is not particularly dangerous, such as those requiring certain medications or those who are pregnant (Turkington 2004). Detection of hypotension also can provide insight into an underlying problem that can then be diagnosed and treated. Blood pressure refers to the force exerted by circulating blood on the walls of blood vessels. The pressure of the circulating blood decreases as blood moves through arteries, arterioles, capillaries, and veins; the term blood pressure generally refers to arterial pressure, in other words, the pressure in the larger arteries. The systolic arterial pressure is defined as the peak pressure in the arteries, which occurs near the beginning of the cardiac cycle; the diastolic arterial pressure is the lowest pressure, which occurs at the resting phase of the cardiac cycle. The average pressure throughout the cardiac cycle is reported as mean arterial pressure; the pulse pressure reflects the difference between the maximum and minimum pressures measured. Blood pressure is continuously regulated by the autonomic nervous system (ANS). The ANS uses an elaborate network of receptors, nerves, and hormones to balance the effects of the sympathetic nervous system, which tends to raise blood pressure, and the parasympathetic nervous system, which lowers it. The vast and rapid compensation abilities of the autonomic nervous system allow normal individuals to maintain an acceptable blood pressure over a wide range of activities and in many disease states. Blood pressure in the arteries rises and falls naturally according to the demands of daily life, rising in cases of exercise and stress and falling during sleep. Healthy people, with completely normal hearts and blood vessels, may have blood pressure well below the average for their age, such as athletes who are in superior physical shape. For such reasons, just having a below average blood pressure typically is not classified as hypotension. Rather, the term is used when blood pressure is so low that not enough blood can reach the brain, resulting in fainting or dizziness (Turkington 2004). Another mechanism causing hypotension is decreased cardiac output despite normal blood volume. This can result from such causes as severe congestive heart failure, large myocardial infarction, or bradycardia. Arrhythmias often result in hypotension by this mechanism. Beta blockers can cause hypotension both by slowing the heart rate and by decreasing the pumping ability of the heart muscle. Decreased cardiac output can rapidly progress to cardiogenic shock. Note, however, that varieties of meditation and/or other mental-physiological disciplines can create temporary hypotension effects as well, but should not be considered unusual. Another mechanism causing hypotension is excessive vasodilation, or insufficient constriction of the resistance blood vessels (mostly arterioles). This can be due to decreased sympathetic nervous system output, or to increased parasympathetic activity occurring as a consequence of injury to the brain or spinal cord, or of dysautonomia, an intrinsic abnormality in autonomic system functioning. Excessive vasodilation can also result from sepsis, acidosis, or medications, such as nitrate preparations, calcium channel blockers, angiotensin II receptor inhibitors, or ACE inhibitors. Many anesthetic agents and techniques, including spinal anesthesia, and most inhalational agents, produce significant vasodilation. Orthostatic hypotension, also called "postural hypotension," is a common form of low blood pressure. It occurs after a change in body position, typically when a person stands up from either a seated or lying position. The normal adjustment of the cardiovascular system to raise blood pressure slightly to account for a positional change does not occur or is not adequate. Orthostatic hypotension is usually transient and represents a delay in the normal compensatory ability of the autonomic nervous system. It is commonly seen in hypovolemia and as a result of various medications. In addition to blood pressure-lowering medications, many psychiatric medications, in particular antidepressants, can have this side effect. Simple blood pressure and heart rate measurements while lying, seated, and standing (with a two-minute delay in between each position change) can confirm the presence of orthostatic hypotension. Orthostatic hypotension is indicated if there is a drop in 20 mmHg of systolic pressure (and a ten mmHg drop in diastolic pressure in some facilities) and a 20 bpm increase in heart rate. Neurocardiogenic syncope is a form of dysautonomia (disease or malfunction of the autonomic nervous system) characterized by an inappropriate drop in blood pressure while in the upright position. Neurocardiogenic syncope is related to vasovagal syncope in that both occur as a result of increased activity of the vagus nerve, the mainstay of the parasympathetic nervous system. Evaluating neurocardiogenic syncope is done with a tilt table test. Postprandial hypotension is another, but rarer form. It occurs 30–75 minutes after eating substantial meals. When a great deal of blood is diverted to the intestines to facilitate digestion and absorption, the body must increase cardiac output and peripheral vasoconstriction in order to maintain enough blood pressure to perfuse vital organs, such as the brain. It is believed that postprandial hypotension is caused by the autonomic nervous system not compensating appropriately, because of aging or a specific disorder. The cardinal symptom of hypotension is lightheadedness or dizziness. If the blood pressure is sufficiently low, fainting and often seizures will occur. A sudden drop in blood pressure is the most serious problem with low blood pressure, since it can be life-threatening as a result of widespread ischemia, meaning a restriction in blood supply to an organ (Turkington, 2004). Diagnosis can be done with a sphygmomanometer, a device commonly used to take blood pressure, involving a soft rubber cuff placed around the upper arm to stop blood flow and then deflated until the blood forces itself through the artery. The systolic (higher) and diastolic (lower) pressure is recorded to ascertain whether the blood pressure is abnormally low. The treatment for hypotension depends on its cause. Asymptomatic hypotension in healthy people usually does not require treatment. Severe hypotension needs to be aggressively treated because reduced blood flow to critical organs, including the brain, heart, and kidneys, may cause organ failure and can ultimately lead to death. Treatment options include systemic vasoconstrictors and other drugs. Adding sodium to a diet can also relieve symptoms of mild hypotension. In mild cases, where the patient is still responsive, laying the person in dorsal decubitus (laying over the back) position and lifting the legs will increase venous return, thus making more blood available to critical organs at the chest and head. Hypotension can usually be successfully treated, unless the trauma (injury) is too extensive or not addressed in time (Turkington 2004). Cunha, J. P., and D. Lee. 2008. Low blood pressure (Hypotension) MedicineNet.com. Retrieved September 19, 2008. Turkington, C. A. 2004. Hypotension. Pages 1752-1753 in J. L. Longe, The Gale Encyclopedia of Medicine, 2nd edition, volume 3. Detroit, MI: Gale Group/Thomson Learning. ISBN 0787654922 (volume); ISBN 0787654892 (set). Undiagnosed Symptoms and Diseases (Undiag). 2008. Hypotension Undiag. Retrieved September 19, 2008. WebMD. 2005. Understanding low blood pressure: The basics WebMD. Retrieved September 19, 2008. This page was last modified on 23 September 2008, at 22:03.